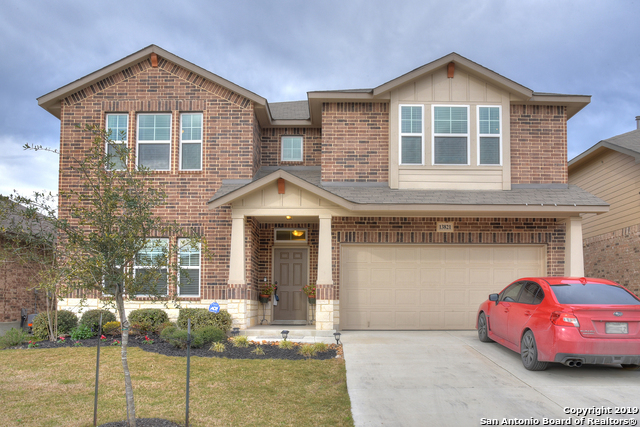 All KALLISON RANCH II - BEXAR homes currently listed for sale in San Antonio as of 04/25/2019 are shown below. You can change the search criteria at any time by pressing the 'Change Search' button below. "Looking for your next dream home? This home has it all - Game Room, Media Room, gourmet kitchen, separate dining room, 5 spacious bedrooms, 3 1/2 bathrooms in a master planned life-style community. Granite counter tops in kitchen with plenty of cabinets to store all your entertaining essentials. Plenty of space to host family & friend gatherings. Community amenities are fabulous including a water slide, large clubhouse, basketball & tennis courts, fitness center and more... even an events' coor"
"PERRY HOMES NEW CONSTRUCTION! Entry with 12-foot ceiling. Library with French doors. Kitchen with a walk-in pantry. Formal dining room. Family room with ceramic tile floor features a wall of windows. Private master suite with a wall of windows. Master bath with dual vanity sinks, corner garden tub, separate glass-enclosed shower, and walk-in closet. Upstairs game room. Covered backyard patio. Two-car garage." "PERRY HOMES NEW CONSTRUCTION! Three bedroom home with a mud room, closet and utility room at the entry. Open kitchen area with a corner pantry and an island looks out to the dining and family room. Secondary bedrooms are connected by a Jack and Jill bathroom. Library with French doors has two windows that face the back yard. Master bedroom has two large windows. Double doors lead to master bath with two vanities, a large corner glass-enclosed shower and a large closet. Covered backyard patio. Sp"